Many fans of old will know that ELO are a band who have released their fair share of compilations down the years, of which a fair few have been commercially successful. EMI imprint Harvest were first out of the blocks in late 1974 when they put out the first of many early ELO collections in the UK with "Showdown" (SHSP4037) but the first charting ELO compilation would be another 18+ months later on the other side of the Atlantic. 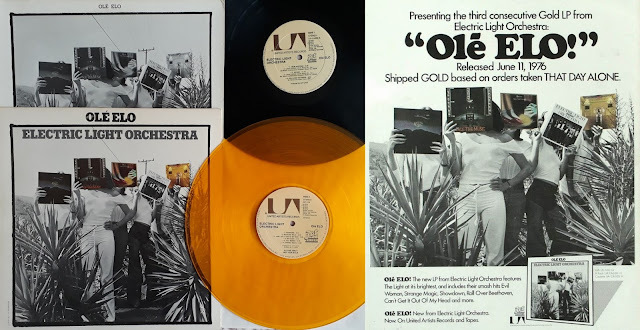 Initially a rather attractive gold vinyl limited DJ only edition (Jet/UA SP-123) and also a red, white and blue vinyl set (to commemorate the American Bicentennial that year) intended for US radio stations, "Olé ELO" (UA-LA630G) was officially released in June 1976 to capitalize on ELO's growing success and status thanks to hit singles such as "Can't Get It Out Of My Head" and "Evil Woman" as well as their gold certified albums "Eldorado" and "Face The Music". It turned out to be an inspired decision as "Olé ELO" - with tracks ranging from "10538 Overture" to "Strange Magic" - was also certified gold after peaking at #24, preparing the ground for "A New World Record" and the ensuing stellar success of the Electric Light Orchestra. Ironically, whilst ELO were soaring in popularity in the United States, they were yet to be embraced in their home country (read this elobf article to find out more) as both "Eldorado" and "Face The Music" failed to chart (as did "On The Third Day") and only "Evil Woman" made the UK Top 10 Singles Chart. It was therefore no surprise that the Jet/Polydor issue of "Olé ELO" (JETLP19) in the UK was quickly withdrawn - making it an instant collectors item alongside the aforementioned US gold vinyl pressing to this very day. This was perhaps the precursor to Jet Records moving from their manufacturing, distribution and marketing from Polydor to United Artists thereafter. Yours Truly KJS also recalls seeing US imports of "Olé ELO" turning up regularly in local record shop shelves at that time and often wondering why there was no UK equivalent especially when Dutch reissues of "Olé ELO" were pressed by Jet/CBS in 1978 with the catalogue number JETLP903. With its contrasting fortunes in the UK and US, "Olé ELO" is the first proper ELO compilation. A greatest hits collection that sometimes slips under the proverbial radar yet continues to have an enigmatic appeal to fans and collectors "All Over The World". 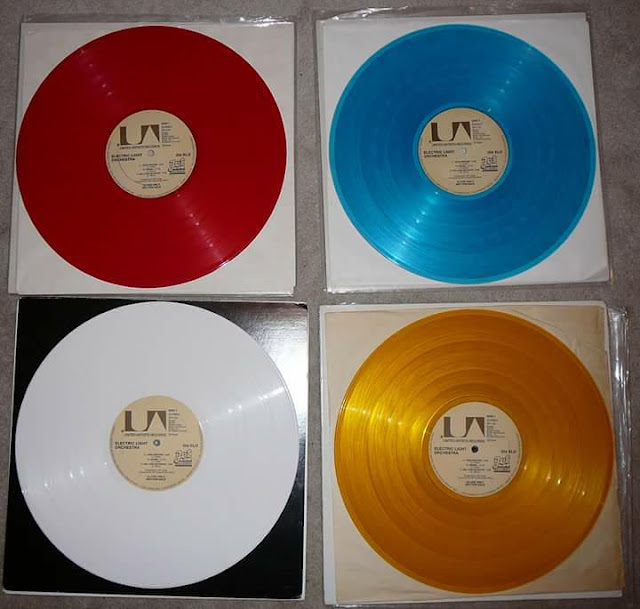 And don’t forget the individual Red White and also Blue vinyl versions. Did the red, white and blue only come in plain covers? I have a white vinyl one and two gold ones. Both gold have the B&W OLE ELO promo cover. One of the discs is pretty worn, but the cover is very nice. I was tempted to swap it to the white one. BUT, I have yet to see a photo or mention of those R, W & B ones having anything other than plain covers.